The "Orateca" was not at fault in the allision in Northern lock in Brunsbüttel on Oct 2. 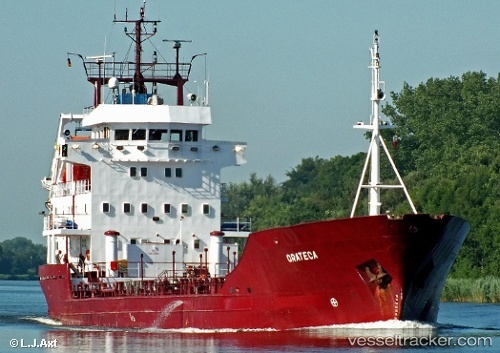 The ship was moored inside the lock, when the Lithuanian cargo m/v "Nautica" entered entered. The "Nautica" got its spring attached, but a cable at the stern became entangled in the propeller, and then the "Nautica" hit the "Orateca". The Danish ship's captain asked to get the lock closed after the allision until the authorities had assessed the extent of damage to the two vessels. The damage appeared to be only superficial scratches, both ships could resume their voyage. On Oct 2, 2012, at 00.45 a.m. the cargo m/v "Nautica" allided with the "Orateca" in the new Northern Lock of the Kiel Canal in Brunsbüttel. The cargo m/v "Nautica" was enroute from Sczeczin to Oostende, the "Orateca" underway from Helsingborg to Hamburg when the latter was hit by the "Nautica" while this ship was about to dock. The lock had to be taken out of service for investigations. The "Orateca" continued its voyage at 2 a.m. and docked at NHG in Hamburg at 5 a.m., the "Nautica" proceeded at 2.10 a.m. The police is investigating.